Today we live in an online business world. No matter what business we run, everything is done online. I believe when you use online tools you make running a business easier. Avoiding cyber security threats is a must. With everything there is always a down side. Cyber Security Threats are a huge problem for all businesses. Learn the basic ways to secure your business in today’s technology driven world. If you don’t have a dedicated IT guy then it’s even a bigger issue. The fact is most business owners don’t until something goes wrong. We prepare ourselves subconsciously for many threats. To be safe we wear our seat-belts, lock our doors and even take our vitamins. These are things that help us. Your business needs to be safe too. How are you helping your business be safe online? Most experts go a little extreme with their cyber tips. I think that we shouldn’t be driving in tanks. I’ve heard things like, you shouldn’t use your real email or you should never write down a password. Realistically, these and many other tips are not going to work. The truth is we don’t have to walk around with bulletproof vests on. Why should we be told to do that online? I have created helpful tips that work and prevent most cyber security threats. These are a must for every business. The truth is, if someone wants to break into your house, they can drive a truck through the door. However, for the most part locking your door and maybe even having an alarm systems are enough. This is true online. Following these quick and easy tips will help prevent cyber threats. I talk about making secure passwords a lot with clients. The number one complaint is they are too hard to remember. I agree. The password s3c4rp8sssw0rds might look hard to remember at first. It is almost impossible to break into, yet it is the words ‘secure password’ put together. The only difference is I replaced the vowels with numbers. Be creative and take two words that are 12 or more characters to get a very secure password, substitute vowels with numbers. Only you know what it means. This is one of many tricks that create secure passwords easy to remember but hard to break into. A secure password is the first step to prevent cyber security threats. You can read more about creating a secure password. My Simple Security product will be out soon, you can subscribe here to be notified when it is out. This is a must. Make sure all your software is up to date. I have told some clients to schedule this task in to your calendar each month. Seriously you have to make sure your computer operating system (Windows or Mac OS X) is up to date. Also your phone’s system is up to date. These will always pop-up. Browser and plugins are the next major update that you need. Malware or viruses will less likely infect your computer if keep these up to date. If you have a website you MUST make sure it is up to date too. These tasks will have to be done by you or someone you hire. If you have WordPress, login to the Dashboard. Click on the Dashboard on the left side to see where it says Updates. Click on Updates to see if any are ready to install. My upcoming product will go into more detail on this and many other security practices. The truth is hackers are always using software to scan computers and websites. They look for outdated software. Cyber security threats can be solved by just updating. I am guilty of this one. I don’t always log off services. My wife always catches me on this one. She will open my computer to check on something and my Facebook will open. Meaning that anyone who opens my computer will be able to tell the world anything they want and it will sound like it’s coming from me! Remember, if you are sharing or have a computer that other people have easy access to you might want to follow this one right now. Remember to logout of a website when your done. This is a tricky one. You will need a password system. I talk about this more in my upcoming Business Security product. The issue with having one password for every website is it will be easy for someone who has your email and password to get into many websites. You will need to come up with a password system that works for you. A quick way of handling this is have a separate password for different types of websites. Remember it’s not only about someone stealing your password from you, but actually getting it from the company you’re using. Many companies have been hacked and username, emails and passwords have been stolen. If you use the same email and password in different websites, someone can potentially gain access. Today you have many options for backing up. You can use a physical hard drive to your computer. More popular are online backups like Carbonite. You can also use DropBox and Google Drive to backup your important data. I tell people to do both. Have a local backup and use online Cloud storage for important documents and pictures. If you have Windows make sure you have an up to date virus scanner. For Mac’s download ClamXav and scan once a month. It’s important to realize that you need to keep these up to date. The more you use your computer online, the more vulnerable your computer is today. I had a client who did not scan their computer and ended up loosing everything on the computer. They also didn’t have a proper backup. It is important to realize the more we are connected the more chance of getting infected. This is the same during the Flu season. The more you go out into public places the more chance of you to be infected. This is just a suggestion. I know it is great and some online products you must use single sign-on to login. (single sign on is when you use your FaceBook, Twitter, Google or another account to login to an online application.) The issue here is some applications can abuse single sign on since they have some access to your account. Realize the application can never get the actual password this way. However, be careful using this! They maybe able to gain access to your address books or send messages on your behalf. This is not good! Some online applications allow you to sign in with a password but also get a text message or email that gives you access. This might be an overkill for everything but it is great for extremely personal items. Most banks have a double authentication with a security question today. Google and other applications have this an option that you can activate in your account settings. Again, these are the basics. Meaning this is a good place to start. There is more that you can do but start here first. Whenever we are being safe there is a limit, a fine line of protecting ourselves and limiting ourselves. 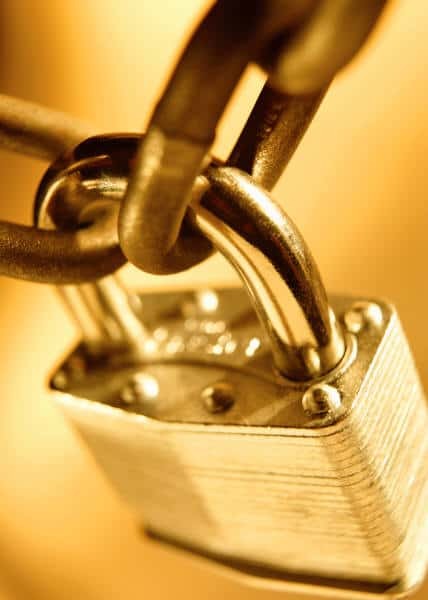 You as a business owner are responsible for your business’ security both physical and online. Let’s talk about your business cyber security threat level. Comment below to let me know what works for your business when it comes to online security. Do you already use any of the above? Let me know, share your comments. It’s time to get secure! Is your website secure? My new website review service is almost up and running. I’m giving away some FREE preview spots. Comment below or contact me if you are interested in a detailed review of your website.